There are so many spring/summer 2019 trends, but we're here to tell you about the ones that are going to genuinely affect your wardrobe. 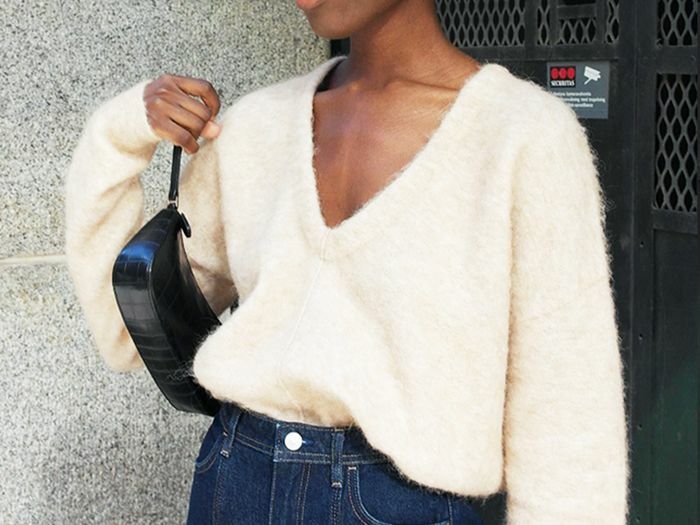 Decoding what's been featured on the catwalk, discovering what has been picked up by buyers or snapped furiously throughout fashion month to hit your feeds on Instagram… This isn't just a case of saying what you see—this is a proper edit of the items you'll want to buy, the old ones you'll be digging out again, the new styling tricks that will turn everything around and the new brand names you'll need to know. First up, let me provide context for the S/S 19 catwalk shows and designer presentations as a whole: There was much talk around feminism and equality, with fashion houses—big and small—using their platforms as a place to host debate and discussion, promote diversity and, most of all, create clothes that women can feel confident and powerful in. We were, after all, in the thick of the #MeToo movement, with global scandals awakening many a dormant mind. "One of the biggest trends we saw during the shows was the overarching theme of the real woman; a welcome return to femininity, women empowerment and wanting to dress for yourself by feeling confident and comfortable," says Elizabeth von der Goltz, global buying director for Net-a-Porter. "In terms of pieces, the trend incorporates everything from comfortable tailoring, longer skirt lengths and relaxed outerwear in flattering and fluid shapes. We saw this most prominently at Riccardo's debut for Burberry and also Loewe, The Row, Valentino and Givenchy. It's a very easy trend to adopt for any woman, and this is what I love most about it," says Goltz. I'm all for designers really thinking about both the hidden and obvious strength fantastic outfits can bring to the table, and what's truly liberating and empowering clothing for women is, undoubtedly, choice (on any given topic). Which perhaps explains why there are so many looks, items and details that make the spring 2019 fashion lineup: You've got loud and quiet looks, sporty and elegant getups and modest and racy silhouettes. There are heritage brands being reborn, continuations of trends that are now a few seasons old, considered collections for mature women with spending power, plenty of Gen Z–friendly and highly Instagrammable items, heaps of minimalism and even more maximalism. Whatever you want, you got it. And it's all here in our report, so keep scrolling. As noted by Elizabeth von der Goltz, there is a certain relaxed elegance that subtly threaded its way through many shows—often coming in simple, demure silhouettes rendered in equally soft colours like oatmeal, biscuit, blush and off-white. In basic terms, we're looking at a spectrum of beige, but in fashion terms, that's one of the chicest things a girl can wear. This colour palette looks grown-up, sophisticated and expensive, even if you aren't able to invest in the looks pictured here. Givenchy's tough tailoring for spring 2019 takes the trend a level deeper into tones of khaki and army fatigues. Powerful both for work and off-duty. Dior's balletic influencers for spring 2019 put these pretty shades of pink-toned beiges at the very centre of Maria Grazia Chiuri's dreamy collection. Over this past year, everything appears to have been fastened with horn and tortoiseshell buttons, but I predict that 2019's update will centre around bows. Whether big or small, these whimsical little additions will be found on everything from summer blouses and dresses to jewellery and hair accessories. Just like leopard print, it would appear that the 1980s will not quit. Plundering the decade for yet another round of inspirational looks, you are going to carry on seeing strong shoulders, lamé, glitzy party dresses, Princess Diana–worthy skirt suits and gaudy accessories that all echo the eighties most outrageous trends. Escada was at the very pinnacle of what you'll recall as 1980s style, so it's no wonder there's plenty to be inspired by for the current creative director, Niall Sloan. We'll take this new outfit head to toe, please. Marc Jacob's elaborate collection was a tour de force in its decorative bows and corsages, gigantic feather dresses, super-sweet colour palette and high-shine metallic fabrics. Many many editors will reference it as a true highlight from NYFW. The logos, the chain jewellery, the sharp shoulders… Chanel is taking is back to the '80s, and we want in. Reflective of both the 1980s comeback and a growing interest in cyberpunk, every kind of highlighter-bright colour hit the runways across New York, Paris, Milan and London. Some designers used satins and lace, others kept things casual in cotton. The trend has already managed to make its way onto the streets, offering IRL inspiration for what can seem like a daunting palette to tackle. Continuing the roll she's been on for a few seasons now, Donatella Versace's power women looked as sassy as ever in these slinky neon dresses styled with perfectly matched accessories. Henry Holland's girls are never backwards in coming forward, so it's no great surprise that fluoro shades played a major part in this designer's hiking-inspired LFW show. Yet another continuation from this summer (and, therefore, more good news for the potential to re-wear things you already own), the prairie dress is about to become an even bigger deal for summer 2019. These long-sleeved, long-length, often floral or broderie anglaise styles are just the kind of "throw on" dresses we've been craving for years. "This trend has a lot to do with the desire to dress more modestly as well as more romantically," explains Emily Gordon-Smith, director of consumer product at trends company Stylus. "It’s feminine but super-casual and covered up. An ongoing theme and one with broader connotations about what it is to be feminine and in control as a woman in the 21st century." From the smaller, independent fashion weeks in Copenhagen and Stockholm to some of the biggest names in the major fashion capitals of the world, this is going to be a major retail smash. You can shop our favourite prairie dresses right here. Erdem's vision of Victoriana never fails to entice A-listers or those partial to a high-drama dress, but alongside the more evening-ready pieces were some pared-back iterations that could easily be worn to great grunge effect by the right girl. This section wouldn't be complete without the brand who specialise in—and have paved the way for—the prairie-dress trend to really take off in the first place. Batsheva's modern take on this old-fashioned silhouette runs from simple daywear versions like this brown maxi through to jazzy velvet and lamé for the evening. Creating possibly my favourite dress ever, Sarah's Burton's romantic, corseted, puff-sleeved midis and gowns were full of historical references yet felt entirely relevant for now—perhaps down to the leather accessories and hard jewellery. Athleisure has taken a more outdoorsy turn for 2019: surf-, skate- and cycling-inspired looks are very much de riguer, with one particular item really summing the whole thing up. "The unexpected cycling-shorts trend, which has been bubbling under for a couple of seasons, is finally coming to fruition. Love it or hate it, but call it the 'Kardashian effect.' This will emerge most commercially in combos of the Lycra biking shorts worn with oversized sweats or slouchy tees and blazers," says Gordon-Smith. 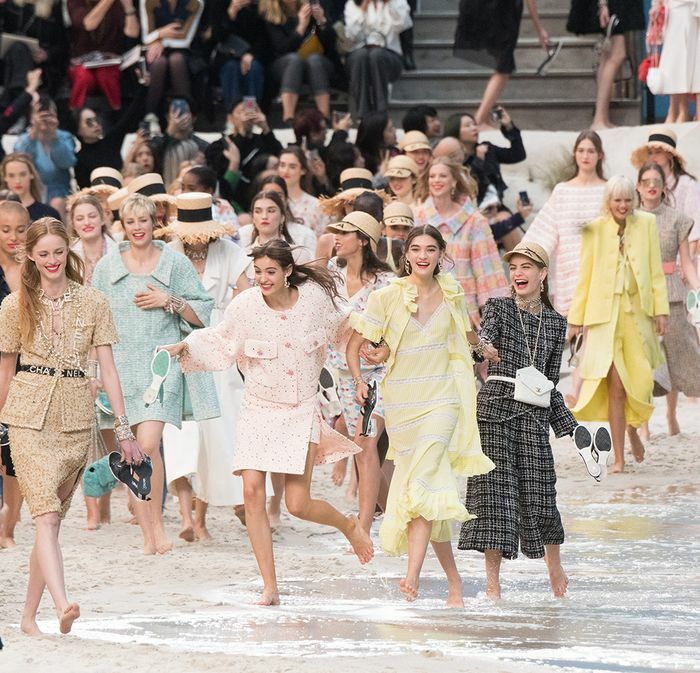 Etro sent pro surfers down the runways, bohemian Chloé girls are now wearing pukka necklaces and Insta-adored label Miaou is putting high-tech jersey separates on the menu for influencers everywhere. From the anklets to the beachy hair—and, of course, the wetsuit-inspired pieces in between—Sportmax's ode to the surf is enough to make you book a holiday ASAP. If your accessories for spring/summer 2019 aren't big enough to warrant their own postcode, fashion isn't interested. Although mini bags and barely theres will still be present, the most outrageous It pieces of the season are going to, quite literally, be huge. Valentino's entire show has been described by many editors as pitch perfect. Pierpaolo Piccioli used the brand's haute couture reference points to create some of the most luxurious yet entirely relaxed and easy-to-wear clothes on the spring 2019 runways, as well as the most fantastical accessories—including these enormous feather hats created with Irish milliner Philip Treacy. Prada's giant satin headbands are going to take over your Instagram feeds—I promise you this. Utilitarian style is next season's default casual look, and nothing sums it up quite as directly as the boilersuit. Loose-fitting but with the option to belt up, easy to wear into the evening with heels yet effortlessly cool with ankle boots or sneaks, this one-piece will be a wonder purchase. No wonder this autumn's iterations have already been selling like hotcakes. Stella McCartney's boilersuit is already set to be big, and it hasn't even launched yet. The team at Net-a-Porter has ordered it in multiple colourways and in bulk for spring 2019 (along with the resort collection that drops beforehand). What ruffles were to 2018, fringing is to 2019. This is the detail you'll see swishing from every possible hem, sleeve, bag, shoe and even necklace. Whether crocheted into something more bohemian, tasselled onto power shoulders or used to decorate basket bags, there appears to be no end to this one detail's potential. Imagine you're Iris Apfel, it's 1960 and you're in Hawaii. What are you going to wear? Everything. Local, artisanal treats, kitsch dresses, vibrant swimwear and OTT sunglasses. You'll probably have a matching towel, sunhat and cocktail, too. Anything that feels from a fabulous holiday gone by is in fashion now, creating the ultimate Instagram packing list. From the 1980s trend pictured above to this rose-tinted view of summers of the past, there's a rise in nostalgia for a reason. "The comfort of nostalgia is a powerful influence right now—as always happens in times of socio-economic uncertainty," says Gordon-Smith. "We all regress to perceived happier times and for the current incarnation of key designers and stylists, this is about their best memories." Marni's triumphant collection had retro references, but plenty of off-kilter mix 'n' match accessories and prints to bring a newness to this idea. Shell jewellery continues to be a big trend for 2019. Isa Arfen's charming collection couldn't be more holiday-ready with its amazing postcard prints and tourist-inspired lookbook. After much debate around its official name (seafoam? mint? pistachio? ), we've landed on shades of sage as the coming season's key colour to experiment with. It's already finding its footing on social media with #greenaesthetic trending on Pinterest, and with pastels now firmly in the S/S lexicon on a regular basis, this is the precise spectrum of greens that will jettison any old look into the new for 2019. "Pastel has only gone up 26% since S/S 18, but being a constant for summer trends, this 26% rise is significant," says Alexandra of Tagwalk. Could sage be the super-shade your workwear wardrobe has been calling out for? Pyer Moss's draped tunic would indicate so. On a jazzier end of the green palette comes this punchy Tibi midi—the austere shape makes a new colour feel entirely appropriate. Surprised to see leopard print all over again for spring 2019? It could be easy to sense that animal motifs have reached their peak already this year, but according to the runways—and the statistics that go with them—fashion's best friend is still very much at your side. Tagwalk, the online platform that's analyses countless runway shows and is often dubbed the "Google of fashion," showed a positive uptick for the trend. "Animal print is still a spring/summer 2019 trend. 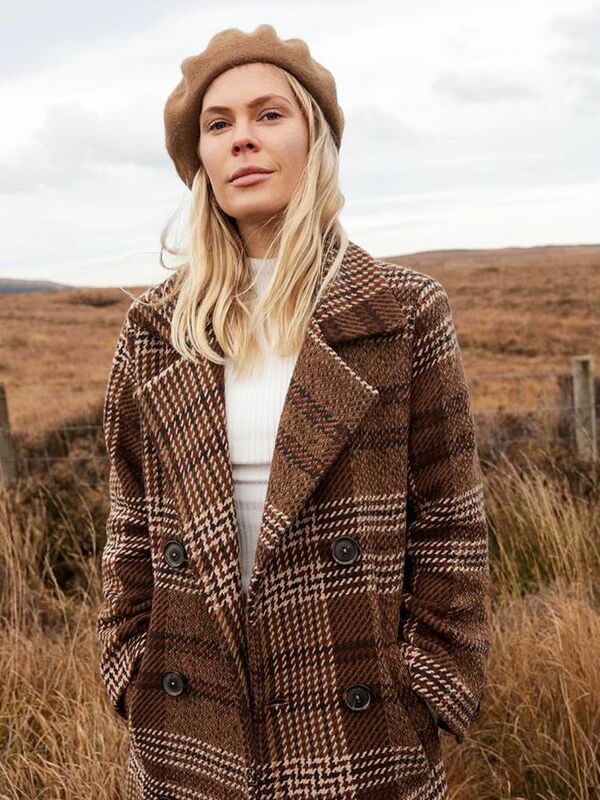 It has gone up 50% since S/S 18, with leading brands such as Burberry, Gucci and Calvin Klein leading the way," says Founder Alexandra Van Houtte. What's moved on with the new leopard-print looks is that they are inherently more elegant. Riccardo Tisci's debut Burberry collection (pictured here) had a comprehensive streetwear section, but it was the classic midi skirts, genteel separates in animal patterns and neutral shades that really had the fashion crowd enraptured. Phew! There's a lot to learn when it comes to spring 2019 trends, but stay with us for all the guidance you'll ever need.